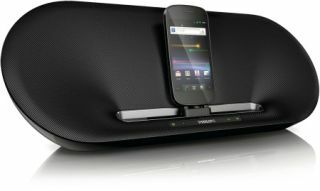 IFA 2011: Philips focuses on Android with new Fidelio docks | What Hi-Fi? Philips has just announced that its Fidelio range is getting three new Android-dedicated models. The new docks are based on the current Fidelio for Apple range, but these new models have a 'unique connector design that adjusts in three dimensions to hold any phone in both portrait and landscape positions. The mini-USB connection doesn't actually handle audio, but the Philips app for Android senses when you dock your portable and makes a Bluetooth link for sending your music. The idea is that you don't notive this happening - it should work in the same seamless way that we've become accustomed to with iPods. While compatibility with every single Android device isn't guaranteed, Philips does reckon that over 90% of them will work. The three models fall under the 'Fidelio for Android' banner, and are known individually as the AS851, AS351 and AS111. Prices for mainland Europe will be €199, €129 and €79 respectively.